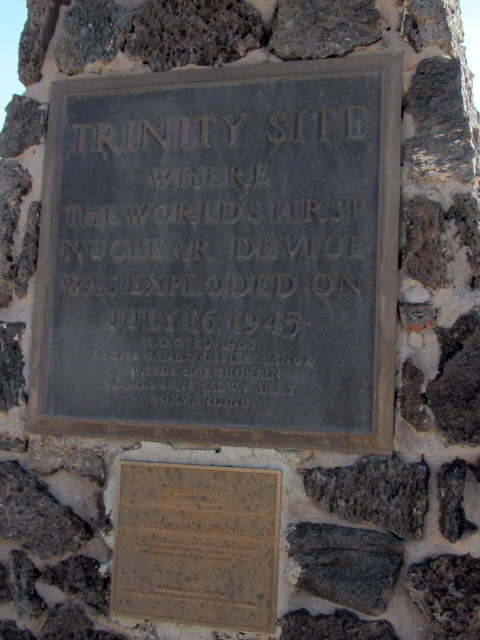 It was here, in the middle of the desert of the White Sands range in southern New Mexico, USA, that the first ever atomic bomb was detonated – in a test that was code-named Trinity. Its fireball and mushroom cloud were the culmination of the Manhattan Project, and the true beginning of the Atomic Age. The power of the atom had successfully been unleashed – and this propelled the US into nuclear superpower status. It immediately proceeded to apply this new power, namely in the bombings of Hiroshima and Nagasaki … and the world has never been the same since. Today a small stone monument marks the spot at Trinity's ground zero. As small as it may be, few other spots on Earth can match this one for dark historical weight. Accordingly this is probably the most significant nuclear tourism site in the world, from a purely historical point of view at least. But unfortunately it's only very occasionally accessible to civilian visitors (namely twice a year, on the first Saturday in April and October). More background info: For background info on the development of the bomb see under Manhattan Project, Hanford, and Los Alamos & Bradbury Science Museum and cf. National Nuclear Museum. For more on the effects and ethics of atomic warfare see under Hiroshima and especially Nagasaki. Compare, too, to the Soviet equivalent: the Polygon or Semipalatinsk Test Site (now in Kazakhstan). Now for the Trinity site itself: by early to mid 1945 the Manhattan Project scientists had reached the point where they were confident enough that their designs for atomic bombs could deliver what they had promised. One of their designs, the simpler gun-type uranium bomb design was even used untested over Hiroshima. In this design, two semi-spheres of plutonium 235 were simply fired at each other inside the bomb to achieve a critical mass once the spheres were combined – which was a simple mechanism but made the bomb more risky for transport and delivery, so it was only the inferior secondary design, really. The more advanced design of a plutonium implosion bomb was much more complex technically, in that a subcritical (and thus stable and easier to handle) amount of plutonium would be compressed to achieve criticality by means of a mantle of conventional explosives around the plutonium core – hence the ball-like appearance of the device (and the "Fat Man" bomb). The explosives around the core were fired all at once with the force directed inwards, so that the plutonium core, so it was envisioned, would be evenly compressed to attain a sustainable nuclear chain reaction. However, given the complexity of this design, it was deemed necessary to conduct a test shot before making it available as a weapon for actual military use. So when the development of "The Gadget", as the Trinity bomb was informally called, was nearing completion, a suitable proving ground had to be found. Los Alamos itself, where the labs were located in mountainous terrain north of Santa Fe, was obviously enough not suitable. So the scientists picked a remote spot that lay within the Army's Alamogordo gun and bombing range (now White Sands Missile Range) in the desert of southern New Mexico, far from any settlements, but not too far from Los Alamos for commuting between the two sites. Ironically (to my mind at least), the valley chosen for the test site already had a "deadly" name: Jornada del Muerto. The preparation of the test ground took months – a base camp, assembly points, measurement and observation bunkers needed to be built, along with the whole infrastructure associated with this. One building already there was the McDonald Ranch House – built in 1913 and previously owned by a German immigrant called Franz Schmidt. His family's ranch was "abandoned" when the Alamogordo Range appropriated the land for military use in 1942. In 1945 the house was chosen as the place where the final assembly of the plutonium core of "The Gadget" would take place; for this, the master bedroom was turned into a "clean room" (again, it's not without irony), i.e. a field lab. The plutonium itself would be delivered by the Hanford Project in Washington State. To get some idea of the physics of such a super-massive explosion, the "100 ton test" was conducted before the actual nuclear test. A hundred tons of conventional TNT were piled on a huge wooden rack and detonated – with a tiny amount of radioactive material inserted, so that its dispersal in the explosion could be ascertained afterwards. The main purpose of the 100-ton pre-test, however, was to calibrate the measuring instruments for the real test. For the nuclear test proper it was initially planned to have a certain safeguard in case criticality and thus a full chain reaction could not be achieved. In that case the first stage conventional compression detonation of "The Gadget" would only have dispersed the dangerous (and valuable!) plutonium all over the area. To prevent this from happening, a huge cylindrical steel containment vessel was brought in, appropriately called Jumbo – as it weighed over 200 tons. It was designed to contain the conventional explosion and retain the plutonium if the nuclear reaction failed … and if it did go off, Jumbo would have been vaporized with it. In the end Jumbo was not used, as the scientists' confidence in their design had grown and they wanted an "untempered" detonation. Jumbo was instead placed at an 800 yard distance from ground zero – and it survived the blast intact! But was later partially destroyed in a different test in 1946. "The Gadget" itself, once assembly was complete, was hoisted to the top of a 100 foot (35 m) high lattice steel tower, as it was estimated that a "mid-air" detonation would be more effective than directly at ground level. The bomb was not dropped from the tower, though, but detonated while stationary on its platform at the top of the tower. It was set off, slightly delayed by bad weather, at exactly 5:29:45 in the morning on 16 July 1945. And with that instant, the Atomic Age had begun. The electronic controls for triggering the detonator mechanisms were located in one of the observation bunkers established at a distance of 10,000 yards (5.6 miles / 9 km), while most of the scientists watched the event from base camp, 10 miles (15 km) away. Other visiting observers were positioned on a hill 20 miles (30 km) away. Even at that distance the heat from the blast was felt … like opening the door of a hot oven, it was described. But most eyewitness reports expressed their awe at the brightness of the initial flash … it was described as being a "second sunrise" – only many times brighter than the midday sun, lasting for about one or two seconds before the fireball rose, becoming increasingly clouded by dust and vaporized materials from the ground. The whole spectacle was "unprecedented, magnificent, beautiful, stupendous and terrifying" (General Thomas Farrell). Expressions of awe also got beyond the descriptive; Oppenheimer himself apparently resorted to Indian mythology, quoting ancient Hindu scripture: "Now I am become Death, the destroyer of worlds" – a quote also reproduced on the roadside commemorative plaque near Stallion Gate. Back to solid physics: the yield of the bomb was estimated at ca. 20 kilotons (equivalent TNT – i.e. it was 200 times more powerful than the 100-ton test). The blast vaporized the 100-foot tower – except for little stumps at the bottom where it was sunk into its concrete foundations. But it didn't leave much of crater, just a rather shallow depression, ca. 4 feet (1.2 m) deep and ca. 250 feet (75 m) across. This was filled with a new substance that the heat of the fireball had created: droplets of molten desert sand that had rained back down to the ground and covered it with a green glass-like layer. It was christened Trinitite. Most of the trinitite was later taken away or buried in the ground, but small pieces of it can still be found at the site. Even though the blast was felt up to 150 miles away, the successful test was at first kept secret. The cover-up story initially was that an ammunition depot had blown up. However, US president Truman, who at the time was attending the Potsdam Conference near Berlin together with Stalin and Churchill to discuss the post-WWII world order, was sent a coded telegram to inform him of the successful test. Later at the conference Truman hinted at the new bomb in a brief conversation with Stalin, who didn't even show much of a reaction. This lead the Western allies to assume Stalin hadn't really grasped what he had been told. In actual fact, however, tough old steely-nerved Joe just kept his poker-face on … and the same evening ordered Kurchatov to speed up the development of the Soviets' own atomic bomb (which was finally tested in 1949 at the Polygon). With the new apocalyptic weapon at hand, Truman made the decision to use it in the still ongoing Pacific War against Japan. And at the same time he wanted to demonstrate to the world – and in particular to Stalin and the emerging rival USSR – the new might of US weaponry. After the bombing of Hiroshima on 6 August with the simpler uranium gun-type device "Little Boy", the Gadget-design plutonium implosion bomb too saw its first use in war three days later when "Fat Man" was dropped on Nagasaki. On 14 August Japan surrendered. WWII was thus over, but the Cold War had only just begun. In fact, you can argue that it was precisely with the Trinity test that this new era began in a millisecond. The millisecond with the most wide-reaching consequences in Planet Earth's entire history. What there is to see: for most of the year hardly anything at all – only the small historical marker plaque by the road, US 380, near the turn-off to Stallion Gate at White Sands Missile Range. You're only allowed into the Range to see the actual Trinity site on the Open House Days held annually, namely on the first Saturday in April and October, respectively. So aim for one of those days and then you can actually walk right up to the very centre of world history's first ground zero! The area is encircled by two rings of fences. The car park is by the circular outer ring, and from here a path leads into the oval inner ring. Within the latter you are free to roam. You won't have the place to yourself, though! It's become immensely popular, with thousands of visitors each year flocking to the site on those Open House dates. Don't get alarmed when you see the "radioactive materials" sign on the fence – they are good for a dramatic-looking photo, but the actual danger is really quite minimal (see below). The main spot that everybody is drawn towards first is obviously the famous marker at the very centre of ground zero. It is actually slightly off centre of the inner fenced area. 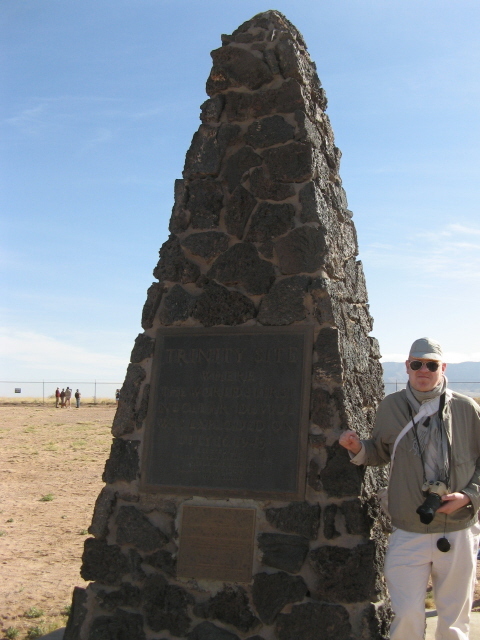 It has the form of an obelisk, made from blocks of lava rock, and a plaque on its side reads: "Trinity Site – where the world's first nuclear device was detonated on July 16, 1945." Below is a second plaque certifying the monument/site the status of "National Historic Landmark". Here, the typical taking photos of each other next to the marker is the main visitor activity – but you'll also see people immediately scrambling around and searching the ground for pieces of trinitite. And indeed it isn't too difficult to find some. Do remember those signs by the entrance, though: taking trinitite off the site constitutes theft. It is very tempting to take a piece as a souvenir, no doubt about that. I felt it too … but think about it: do you really want to risk running into a military police check and be caught with it? If you feel you must own a piece of the stuff, then there's a legal alternative: by the turn-off from US 380 there's a sign pointing east saying "trinitite for sale 17 miles". Probably, one would hope, these are pieces taken years ago when it wasn't yet illegal to do so. I didn't check it out so I can't say anything about prices, but I would presume they'd charge at least what you'd have to fork out when buying the stuff online, i.e. between 20 and 80 USD for average-sized fragments. The choice is yours. I decided I could live without it. What else is there to see at ground zero? Not much. A few yards from the historical marker one of the stumps of the foundations of the 100-foot tower, on top of which the bomb was detonated, can be seen poking out of the ground – protected by a crude little fence. It's really just a clump of concrete with trimmed metal spikes pointing upwards from it. But use your imagination to picture what happened to the rest of the tower: it was otherwise completely vaporized by the blast! The single actual "museum" artefact on display within the inner ring is a "Fat Man" bomb casing replica on a truck. And a bit further on there's an odd-looking low enclosed structure. Beneath this is the one area of the original crater floor that was left untouched, so it's filled with its patterned coating of solidified trinitite. It is now protected by the low, shed-like metal structure you see. Unfortunately, you can no longer look inside. There used to be an opening for viewing, and a sign still claims there is, but in actual fact it is now completely sealed. Shame. But that's what it is. Near the ground zero marker and all along the inner fence to the north-east of the enclosure several information panels with photos and diagrams etc. can be viewed. 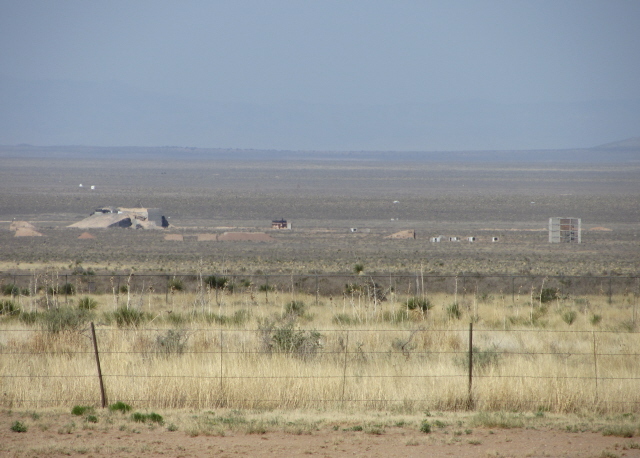 Some are a bit faded due to exposure to the elements, but they provide some background information about the site, the Trinity test and the people involved in it – with a focus on military personnel rather than the Los Alamos scientists. One large artefact you can't fail to notice is to be found just outside the outer ring entrance to the site: Jumbo, the gigantic steel canister that was originally intended to contain the bomb, but instead was later used in a test in 1946 in which the Army detonated eight 500-pound conventional bombs inside it. This blew the top and bottom off, but the side walls are only partially scarred inside. You can stand inside this bizarre steel monster … and again, people have their pictures taken here. The only other relic related to the test is a single former instrumentation bunker just to the west of the site by the access road (where there is limited additional parking). It's not much to look at, basically just a mound of earth with some bits of concrete and wood poking out. In the distance you can see some other surviving structures, including some intriguing ruins – but all of these remain out of bounds for visitors. Most of the original observation bunkers and instrumentation installations have been dismantled and removed in any case. However, you can visit the McDonald Ranch, where the plutonium core was assembled just prior to the Trinity test in a kind of field lab. The house still stands (or rather: has been refurbished/re-erected). To visit it you must take one of the shuttle buses provided (for free) that make the ca. 2 mile (3 km) journey regularly, on demand, departing from the south-western area of the car park area. You're not allowed to walk or drive it on your own. At the Ranch House you can wander around the grounds, where information panels bring some sections of it to life a bit – e.g. the former water tank that the soldiers who prepared the test ground often used as a swimming pool (now it's water-less). Next to it stands a very Western-movie like former windmill tower. Some of the sheds/stables next to the Ranch house are derelict and visitors are admonished to keep out. You can, however, enter the old Ranch House itself. Note the inscription at the door: "please wipe feet" – but you do not need to heed this. It's a recreation of the inscription from the days prior to the test when part of the building was converted into a "clean room" for the assembly of the bomb's core. Today, the inside is largely bare. In the relevant room, a single sign dangles from the ceiling saying "Plutonium Assembly Room", which makes for a rather cool and unusual photo op. Otherwise there are a couple of bare pieces of furniture and a small number of yet more information panels, some related to the building and the Trinity test, others about the local flora and fauna (in particular rattlesnakes). It's all very well organized in general. Using the descriptive phrase "with military precision" is actually spot-on here as it is indeed the military (of White Sands Missile Range) that organizes the whole Open House Day thing, from manning the checkpoints at the gates to soldiers ushering you into parking spaces at the site or the drivers of the shuttle buses to McDonald Ranch House. Not least in this respect the experience at Trinity is totally different compared to its ex-Soviet counterpart, now in independent Kazakhstan, namely the Opytnoe Pole site of the Polygon, better known to the world as the Semipalatinsk Test Site. Going there has all the exotic adventure that Trinity pretty much lacks thanks to all the touristy infrastructure here. The Polygon has none of that. Nor does it even have a historical marker. It is totally "raw". But then again it was not only the "Joe 1" bomb (i.e. the very first Soviet atomic bomb – essentially a copy of the Gadget/Fat Man design) that was set off there, but the site was re-used many times. That also makes it a lot more dicey to go there … as radiation levels at its multiple-use ground zero are significantly higher than at one-off Trinity. But on the other hand there's a lot more of the test infrastructure still to be seen at the Polygon – in particular whole rows of instrumentation towers. In the end, though, you can't say that the Trinity site and the Polygon are in genuine competition … few people will travel to both. And while the Polygon is truly hard-core extreme dark tourism … Trinity is not, really. It's too mainstream-y crowded for that. Nevertheless, it is obviously the Number One must-do in the US on any nuclear tourist's bucket list. Location: in the northern part of the White Sands Missile Range, New Mexico, USA. The nearest towns are Socorro, ca. 35 miles (55 km) away to the north-west and Alamogordo some 60 miles (100 km) to the south-east. Access and costs: very restricted: only possible on one specific day each year; but free. Details: the site lies within the restricted military territory of the White Sands Missile Range and is only accessible to the public on the Open House Days held twice every year, namely on the first Saturdays of April and October. So planning ahead and timing it right is absolutely crucial – in fact, I planned my entire Easter 2012 trip to the US around Trinity Day, which that year was on 7 April. On the day, you can drive your own vehicle to the site, either from Stallion Gate off Highway US 380 on the northern edge of the Range, or as part of an escorted convoy at a fixed time from Alamogordo (setting off at 8 a.m., returning between 12:30 and 1 p.m.). Obviously, the former, individual option is far preferable if you want to avoid the worst of the crowds. At Stallion Gate, there's a checkpoint, but it's not a big deal being allowed in. You will need to show some form of picture identification, preferably your passport if you're a foreigner. But I found the whole procedure quite friendly and smooth-going. They even hand out a useful brochure about the site and its history – and it is all for free! At least it still was when I went in 2012 – I had heard it rumoured that a fee of 25 USD or so would be introduced after 2011; but that wasn't the case yet when I went in April 2012. And the WSMR website still says it's free. An alternative that is definitely not for free is joining the organized guided tours offered by the National Museum of Nuclear Science and History in Albuquerque. For these you need to sign up in advance, and as they include transportation by coach and a guide, a suitably large fee is levied. I can't find any information about this on the museum's website right now – but I seem to remember that it was something like 80 USD when I last saw it advertised. Directions for individual self-drive visits are straightforward. First you have to make it to US 380, most likely coming from the west along I-25 between Albuquerque and Las Cruces/El Paso: take exit 139 off I-25 near San Antonio for Highway 380 and then head east for ca. 12 miles (18 km). The turn-off to Stallion Gate is clearly enough signposted … and there's a historical marker for the Trinity site by the road too. So it's hard to miss. To make absolutely sure you don't miss it, use the map co-ordinates given above. Cars line up at the military checkpoint at Stallion Gate, which is a few miles from the turn-off. When I was there, the queue cleared fairly quickly. But then again, I was there quite early, ca. 8:30 a.m., only a short while after the gate had opened (8 a.m.). Later in the day, it can get quite a lot busier. Some people had told me that it would be advisable to get in line way ahead of the site's opening times, but that turned out to be unnecessary. The 15 minute wait at the gate was well within tolerable limits. It may also be a good idea to get there towards the end of the Open Day, when the organized tours and the Alamogordo convey have already left for the return journey. The gates are closed again at 2 p.m., though, so you don't want to leave too late either. Once you're through the gate you just stay on the road and keep driving (no stopping allowed!!) until you get to the clearly marked final turn-off to Trinity after another ca. 17 miles (27 km). From here it's only a short drive to the large car park just outside the fenced-off ground zero area. Military personnel are on hand to guide drivers to parking spaces. It's all very well organized. There are portable toilets placed by the car park for the day, souvenir and information stands, and even an open air BBQ stand. For visitors with disabilities/mobility problems there is also a golf cart service to cover the distance between the car park and the ground zero spot. Everybody else has to walk the couple of hundred yards. You have to stay within the marked area for visitors, though. Easy enough at ground zero as it is surrounded by a fence anyway. But do not stray off into the Range from the car park. To get to the McDonald Ranch you have to use one of the shuttle buses provided by the military that make the run at regular intervals. Driving there in your own vehicle is not allowed. Another ruling to observe is this: pieces of trinitite may still be found at the site but visitors are not allowed to take any with them when they leave – a warning sign makes it quite clear that this would be regarded as theft of government property and could result in hefty fines or even imprisonment. So just leave it. 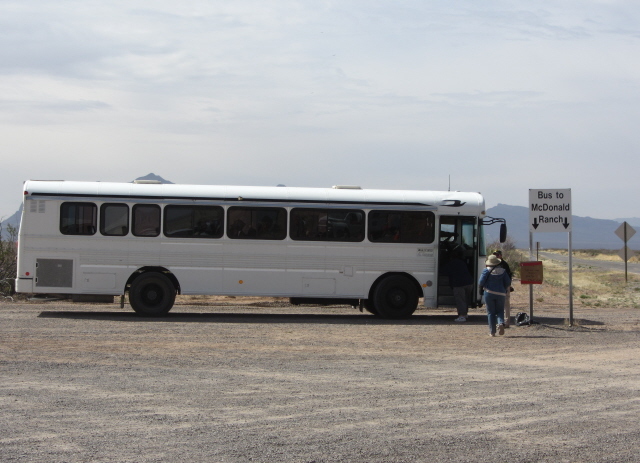 Photography, however, is allowed at the site (unlike at the NTS), but: nowhere else within the White Sands Missile Range – so when arriving at the checkpoints, put your camera away until you've reached the car park at Trinity. Finally: is it safe to go? Isn't the site still radioactive? Answer: it is safe, in so far as the radiation at the site is only minimally elevated from normal background levels. Handling trinitite is not advised – but almost everybody does it. Just make sure you wash your hands afterwards, especially before eating, to avoid ingesting any particles. But even trinitite's radioactivity is low. Overall, the extra exposure you'll get during a one to two hour visit will still be less than that during a coast-to-coast commercial flight. Time required: The walk around ground zero doesn't have to take long. Some people only stay for 20 minutes or so. If you want to read all the interpretative text-and-photo panels near ground zero and along the fence, then you will need longer than that. Additional time has to be factored in for taking the shuttle bus to the McDonald Ranch House and back. In total, one to two hours should be a reasonable estimate. But this does not include driving time! All in all, then, you'd have to set aside the better part of a whole day for the excursion. Combinations with other dark destinations: Thematically, the place most intimately linked to the Trinity site is obviously Los Alamos, where the Manhattan Project had developed the bomb. You can visit the town (but not the inside of the current labs) and see some of the historic buildings there (e.g. where Oppenheimer used to live). The nuclear history of the place is recounted and illustrated in the Bradbury Science Museum in the centre of town. Los Alamos is a about an hour's drive north of Santa Fe, which in turn is about three to four hours' drive from Stallion Gate .. so it's hardly feasible to do both Los Alamos and Trinity in a single day. Much closer to the Trinity site is is the excellent National Nuclear Museum in Albuquerque, New Mexico's largest city, located to the north of White Sands Missile Range. It's bigger and much more comprehensive than its Los Alamos equivalent, in fact, and certainly a highlight for any nuclear tourist. Both museums feature models of "The Gadget", "Little Boy" and "Fat Man" and cover the history the Manhattan Project. The Los Alamos museum is more focused on the scientific side and the personal stories of the people involved, while the Albuquerque counterpart has a wider-ranging overall scope and significantly more artefacts, including an open-air park of really big exhibits (such as a B-52 and several ICBMs). The topic of nuclear testing is further explored at the National Atomic Testing Museum in Las Vegas, Nevada. That museum's coverage also includes Trinity but is mostly focused on the nearby NTS, as well as the testing grounds in the Pacific (see Bikini). The NTS itself can also be visited, but access is even more tightly restricted than at White Sands – applications for places on coach tours of the site have to be submitted many weeks in advance, you'll be escorted and no cameras are allowed! Much more accessible and the closest other point of perhaps marginal interest to the dark tourist is the White Sands Missile Range Museum, which has a large collection of rockets on display, mostly smaller ones of military types. The New Mexico Museum of Space History in Alamogordo, on the other hand, concentrates more on the "civilian" adventure of space exploration and has, amongst others, a Saturn/Apollo capsule testing exhibit. El Paso, just across the border in Texas is not far either. Further away still, Roswell is a prime attraction for those addicted to myths of UFOs and conspiracy theories about visits by extraterrestrial beings covered-up by the US military. As a non-believer I happily gave the place a miss – but those prepared at least to toy a bit with the stories and see what levels popular ufology can aspire to should definitely check it out. It's the world's most legendary site of its kind. Combinations with non-dark destinations: obviously nothing whatsoever in the immediate vicinity … and even if there was anything, you wouldn't be allowed any access by the military. So the nearest general tourist destinations can only be found outside the military White Sands Missile Range. The attraction that gives the missile range its name, the White Sands National Monument, naturally has to be mentioned first here. This is the world's largest gypsum dune field, so indeed a mass of just dazzling white sand dunes. It's famed, especially amongst photographers, as one of the visually most stunning natural monuments in the USA … unfortunately I couldn't go when I was in the area, as I was running late and it was raining (unusually in these parts! ), so it wouldn't have looked right in any case. It's supposed to be best at around sunset (on clear days! ), when long atmospheric shadows form and the white slowly turns pink. To the west of the Missile Range lies an El Dorado for nature lovers, especially birdwatchers, in the form of the Bosque del Apache National Wildlife Refuge, near San Antonio. Further afield to the east are the world-famous Carlsbad Caverns – probably the Number One natural attraction in New Mexico, while the Gila Cliff Dwellings National Monument to the west is one of the more remote sites of relics from the Native American past. The nearest cities to White Sands (other than Albuquerque and Alomogordo) are Las Cruces, New Mexico's second largest, and El Paso just across the border in Texas, right on the border with Mexico.